The body of work collected here represents the combined efforts of organizations worldwide. As the Open Educational Resources movement has grown, so has the body of research being produced on the topic. We invite you to engage with the new discoveries and analyses that this collection has to offer. Through interviews with the Curriki management team, analysis of internal documents, observations of internal user data collection practices, and a survey and interviews with Curriki users, the Curriki case study explored use patterns and user perceptions of the site, its resources and tools. The specific questions addressed include: 1) how often and why users are coming to Curriki; 2) how they use and engage around the Curriki site, its tools and its resources; and 3) what factors help or hinder engagement and use. The goal of this case study has been to develop an understanding of the mechanisms and processes that can help to attract and sustain users over time, and to facilitate and enhance their use, reuse and content contribution experiences. Mission 2007: Every Village a Knowledge Centre was formed to establish telecentres offering shared access to information and communication technologies (ICTs) in each of India's 600,000 villages by the year 2007. The telecentres would support community development and poverty reduction, and would be run by managers trained in specific skill sets that would allow them to serve the diverse needs of the communities they support. The Mission 2007 Training Commons initiative, a collaborative, open content approach drawing on existing trainer expertise, was established to develop resources that could support trainers through a 'living curriculum': materials that were free, accessible online, and easily adapted. The primary objective of the Training Commons case study was to understand and document the practices, processes, successes, and challenges of the partnership and the content development, and to assess the overall impact on stakeholders. Several key learnings were identified that hold relevance to other OER projects, including 1) the role of culture in securing and maintaining open content partnerships, 2) the importance of workflow creation and supports and 3) incorporating user feedback early on to facilitate localization of content and differentiation of content among key types of users; resulting in content that is adaptable and draws on the expertise of multiple partners and individuals. Interactive computer simulations with complex representations and sophisticated graphics are a relatively new addition to the classroom, and research in this area is limited. We have conducted over 200 individual student interviews during which the students described what they were thinking as they interacted with simulations. 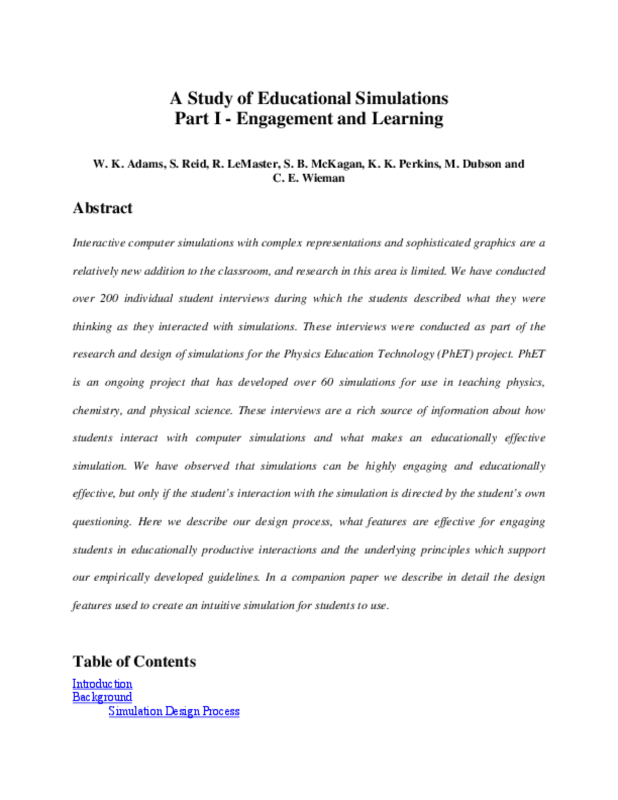 These interviews were conducted as part of the research and design of simulations for the Physics Education Technology (PhET) project. PhET is an ongoing project that has developed over 60 simulations for use in teaching physics, chemistry, and physical science. These interviews are a rich source of information about how students interact with computer simulations and what makes an educationally effective simulation. 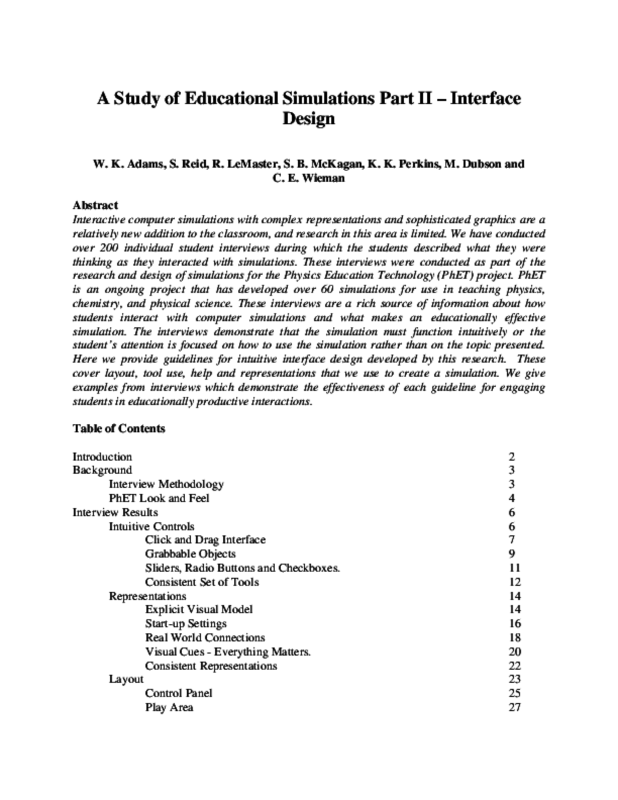 The interviews demonstrate that the simulation must function intuitively or the student's attention is focused on how to use the simulation rather than on the topic presented. Here we provide guidelines for intuitive interface design developed by this research. These cover layout, tool use, help and representations that we use to create a simulation. We give examples from interviews which demonstrate the effectiveness of each guideline for engaging students in educationally productive interactions. Making educational materials freely available on the web is not only a noble enterprise, but also fits the call of helping people to become lifelong learners; a call which gets louder and louder every day. The world is rapidly changing, requiring us to continuously update our knowledge and skills. A problem with this approach to lifelong learning is that the materials that are made available are often both incomplete and unsuitable for independent learning in an online setting. The OpenER (Open Educational Resources) project at the Open Universiteit Nederland makes more than 20 short courses, originally developed for independent-study, freely available from the website www.opener.ou.nl. For our research we start from an envisioned online learning environment now under development. We use backcasting to select research topics that form steps from the current to the ultimate situation. The two experiments we report on here are an extension to standard forum software and the use of student notes to annotate learning materials: two small steps towards our ultimate open learning environment. Quantum mechanics is difficult to learn because it is counterintuitive, hard to visualize, mathematically challenging, and abstract. The Physics Education Technology (PhET) Project, known for its interactive computer simulations for teaching and learning physics, now includes 18 simulations on quantum mechanics designed to improve learning of this difficult subject. Our simulations include several key features to help students build mental models and intuitions about quantum mechanics: visual representations of abstract concepts and microscopic processes that cannot be directly observed, interactive environments that directly couple students' actions to animations, connections to everyday life, and calculations so students can focus on the concepts rather than the math. Like all PhET simulations, these are developed using the results of education research and feedback from educators, and are tested in student interviews and classroom studies. 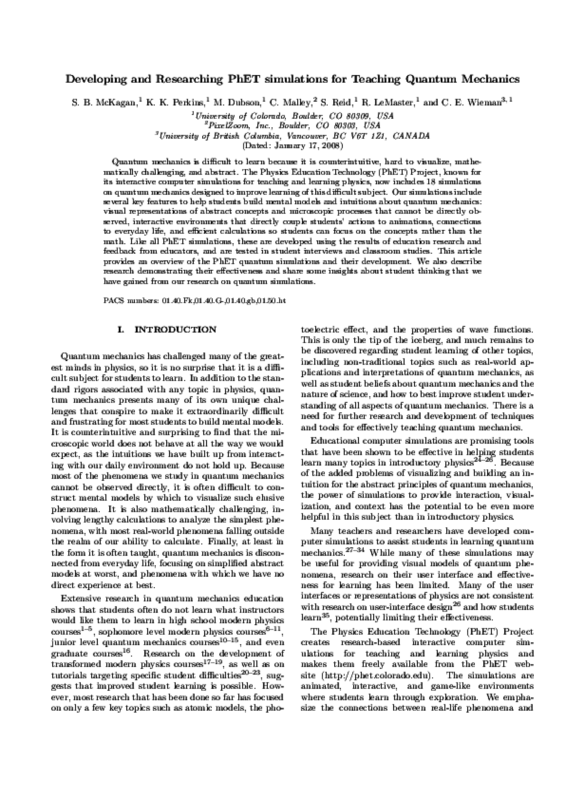 This article provides an overview of the PhET quantum simulations and their development. We also describe research demonstrating their effectiveness and share some insights about student thinking that we have gained from our research on quantum simulations. This article presents the challenges and rewards of sharing research content through a discussion of Open Context, a new open access data publication system for field sciences and museum collections. Open Context is the first data repository of its kind, allowing self-publication of research data, community commentary through tagging, and clear citation and stable hyperlinks, and Creative Commons licenses that make reusing content legal and easy. 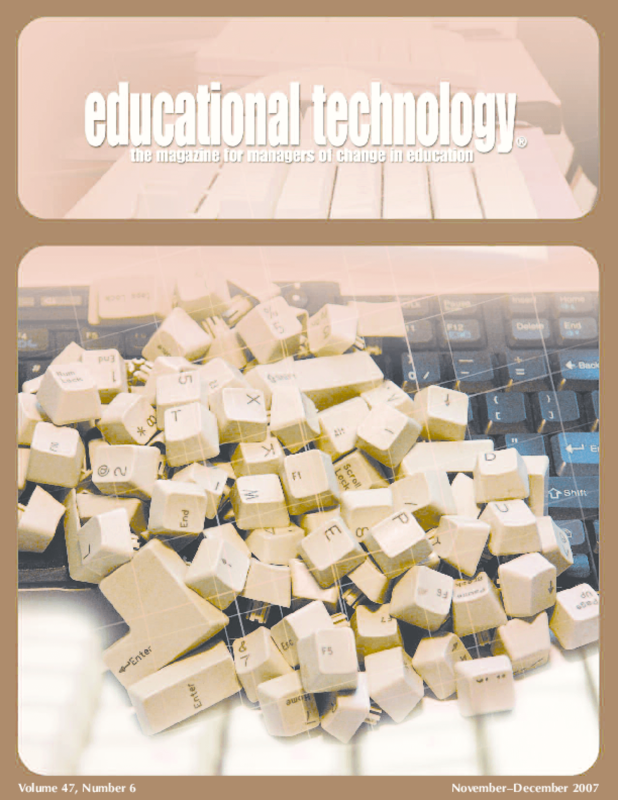 The Nov-Dec 2007 issue of Educational Technology magazine is an entire special issue dedicated to "Opening Educational Resources." 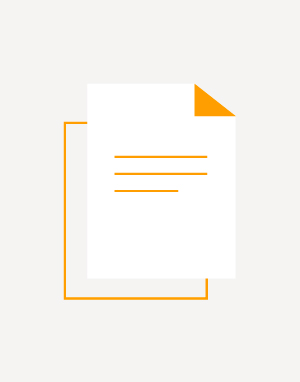 A series of articles in this issue highlight open educational models, including OpenCourseWare, Connexions and this piece on Open Context, co-authored by Sarah Whitcher Kansa and Eric Kansa.